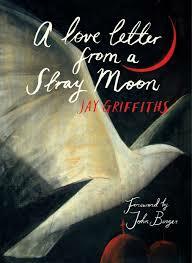 After listening to In Our Time on Radio 4 about Frida Kahlo recently, I’ve been reading Jay Griffiths’ book inspired by Kahlo, A Love Letter from a Stray Moon. It’s an unusual book; short (113 pages) and written as a kind of prose-poem, in which the words seem to come tumbling out as if they represent Kahlo’s stream of consciousness, yet also carefully structured. The text’s form owes more, perhaps, to poetry than to prose, despite being divided into chapters: in its use of imagery, repeated metaphors, alliteration and other rhetorical devices to cause the reader to pause and reflect, it is a story- poem in prose, imagining Kahlo’s inner life. There is a great deal of fascination with Kahlo (1907-1954). Married to the more famous painter Diego Rivera, she became increasingly popular in the 1970s, in part due to her political views (Communist) and the increasing interest of feminist critics in neglected female painters. Now, she is almost worshipped as an icon of suffering womanhood, who painted her pain and femaleness across every canvas. Her life was short and tragic, blighted by an accident which left her crippled and infertile. The obsession with her life tends to cloud the view of her work, and one of the significant things that this book does is to reflect her art in the text. 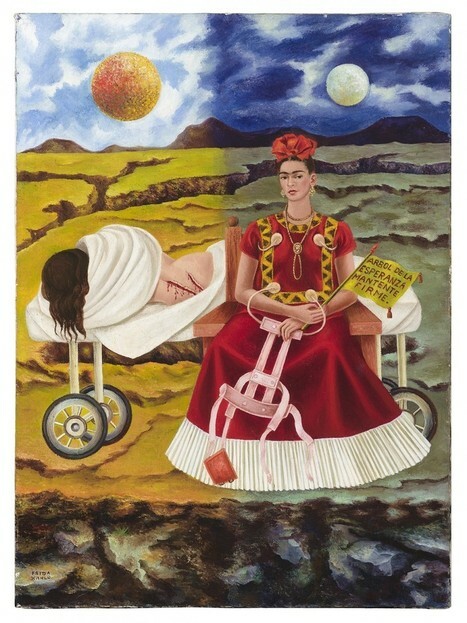 Using the repeated metaphor of the woman Frida as the moon, a traditional emblem of womanhood, and an image which appears in her work, Griffiths extends this metaphor as a way of making the work universal. Consequently, the book is both personal and particular, relating Frida’s own life and narrating her pain, her joy, her loss and her passions, but also opening up these emotions and experiences as relevant to all women. 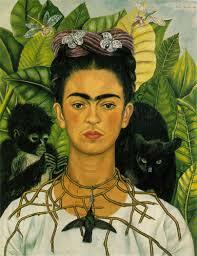 Frida is thus portrayed as Everywoman, both an inspiration and a cipher as well as a real person. Given the tendency for her paintings to be read biographically, the book provides a way to read her life as inspirational but not personal. (This seems particularly pertinent to me at the moment as I’m writing about Elizabeth Siddal, another woman generally known for her life not her work). For example, Kahlo’s paintings which appear to depict her own, particular pain also offer a visualisation of pain more generally, pain depicted in art, as this article in the Guardian explains. The moon is given wider significance, not just as an emblem of womanhood, but as an aspect of nature which controls life, marking time. Kahlo figures herself as the moon in this story, and in contrast to the moon’s silvery light, Rivera is imagined as the sun, burning with passion. 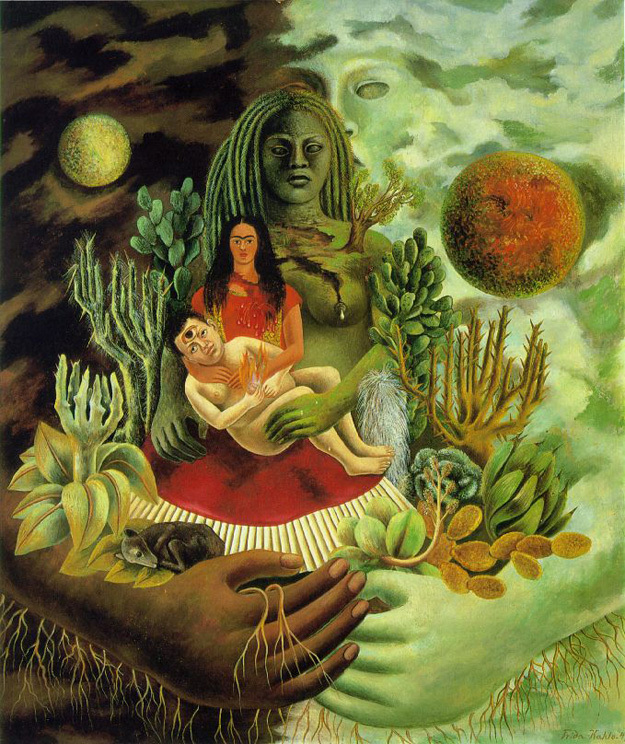 Kahlo’s sister, Cristina, with whom Rivera had an affair, appears as the earth, fertile and lush unlike the barren moon; these astral bodies circle each other, envious but irresistibly drawn to one another. I would have chosen to be Cuaxolotl, goddess of the hearth, but I was made Coyolxauhqui, goddess of the moon. As such, I am always exiled, on the brink of mind and light. Does it matter how I yearn for the hearth or for green day and fullness, round belly and fruitness? … I painted my barrenness and the fertility of the earth. So conjure me starlight, Prospero, and I will wear it like a jacket. Take a cloud, sewn with blossom, and I will sleep under it like a mohair blanket. Weave me a spellbound home and I will nest in it like a bird in its own spring. The book does well to weave the visual imagery so clearly and evocatively, drawing on without attempting to recreate Lahlo’s painting or her life story. The text plays with the combination of art and literature, life and art, politics, passion and poetry, which encourages the reader to throw caution to the winds and, as Kahlo says in the book, ‘really live’. This isn’t a perfect book; there are moments which seem to fall flat, words which don’t quite ring true, just occasionally, but in its literary recreation of art, and its focus on the experience of women, not just one woman, it’s both passionate and inspiring.